MOST Malaysians are not prepared for retirement and ageing. Pension and EPF (Employees Provident Fund) will only take them so far and with the average lifespan for Malaysians estimated at 75 years, many will have to rely on family, friends and charity in the last years of their life. Seeking to change this scenario, the panel discussion at the Sustainable Retirement & Aged Care Conference (SRACC), organised by Kenanga in partnership with Aged Care Group (ACG), delved into the topic of “Malaysia’s Financial Options for Retirement and Aged Care to Ensure Lifelong Sustainability”. “We would like to see how financial institutions can work together because moving forward we need to have the money to sustain our retirement. “In order to have a sustainable retirement, we have to continue saving our money. The question is how do we help Malaysians put it aside so that they will not use it until the day they need it to pay for their aged care services,” asked Yip. 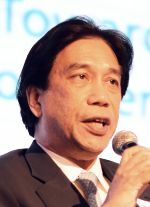 Balqais Yusoff, head of EPF’s Strategy Management Department, said that EPF believes that in order to sustain financial security, Malaysians must have a replacement income after retirement. “We believe people should have multiple sources of income to cover themselves, because when they become aged, they will need to have more income as they are no longer productive. So, they need to have an income to sustain their basic needs, wants, as well as the rising medical costs. “Right now, in Malaysia, we are seeing an increase in life expectancy whereby the average life expectancy is 75. How do you accumulate your wealth during the 30-35 years of working life and can it cover the years after retirement?” asked Balqais. Yip pointed out that there is a segment of society that wouldn’t have sufficient or any EPF savings. This includes homemakers and the self-employed who often do not make contributions. 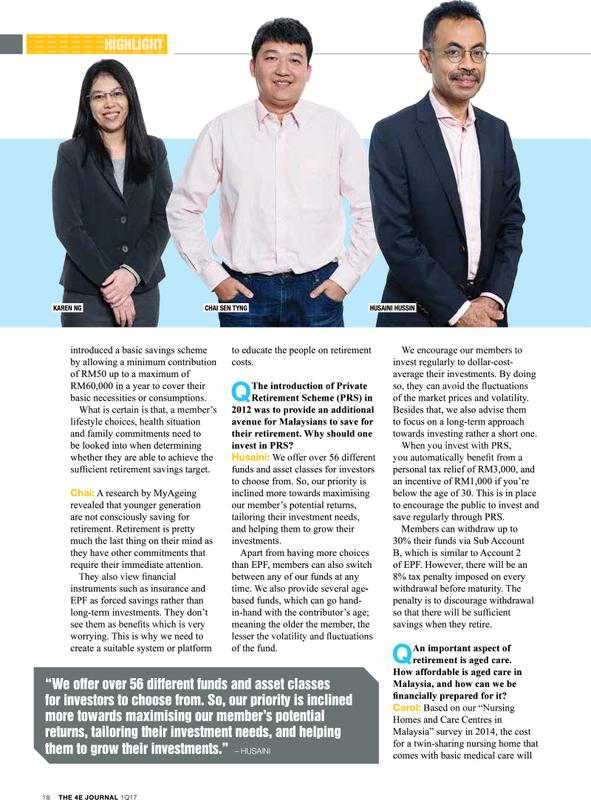 Dato’ Steve Ong, chief executive officer of the Private Pension Administrator Malaysia (PPA), which is the independent central administrator for the PRS, said this is where savings comes in. “The big consequence is not that at age 60 you stop work; it’s that you stop earning. The minute you stop earning, your income stops. That is the crux of the matter. “All of us who are employed are gainfully earning our income and that supports our housing, healthcare and lifestyle. “So, when you stop working, it means you stop earning and you stop that income stream. You need that to have savings to generate a passive replacement income. We have to educate the public to really get the message across that EPF savings at the moment isn’t even enough. For those who withdraw their EPF money end up spending it all within five years, while their retirement might go on for 20-25 years,” said Ong. He explained that this is where PRS can help as it offers Malaysians a way to save their money for retirement. “PRS is not a product. It is a voluntary national scheme. It addresses the need to provide a formal voluntary pillar so that people can have the confidence that it is safe, regulated, and provides a system for private employees who have EPF but still need to top up; for civil servants who retire and have pension which is still insufficient; and for the self-employed who may not be contributing to EPF or putting money into the bank. “We have various savings vehicles in the country. The question is, are they designed specifically for retirement? If not, then the issue is simply this: Most of the money that people save is in the banks. What do they do? It’s like a giant cookie jar. When they need money, they take it out. They take, take, take and what’s left is for retirement. It’s inadequate; it’s insufficient; and it’s not sustainable,” he said. What about the role of insurance? Anusha Thavarajah, chief executive officer of AIA, said that 20 years ago, Malaysia was still a very young society and one where the family network was very strong. Because of this, we never worried about retirement. We assumed that our children would look after us. However, society has changed a lot in the last 25 years, and the baby boomers increasingly want to take care of themselves as they age instead of relying on their children. According to her, it is important to create awareness on the importance of having enough. “Today, what we want to do is make people aware that it’s important that they have enough. We’re teaching our distributors that when they meet customers and friends, they have a social obligation to make sure that their friends and family are adequately protected,” said Anusha. Yip asked the panellists if financial institutions can work together to make it easier for the elderly, so that when the money is needed, it will almost automatically pay for the care and services. 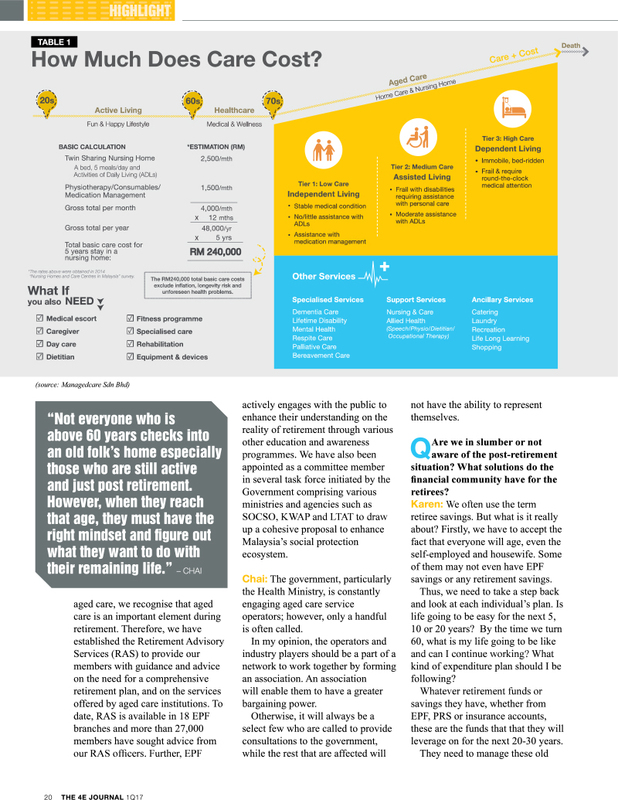 This way, the elderly don’t have to think about which stream to get their money from – EPF, PRS, insurance or unit trust – as all of these would work together seamlessly to pay for the elderly’s needs. According to EPF’s Balqais, the government is trying to establish a national social security task force to look at an integrated ecosystem. “That will cover not just healthcare, but also basic income security for working aged people as well as care for the aged. It will be a concerted effort that will require working with employers, employees, NGOs, academia as well as financial institutions to develop more products for pre and post-retirement. “The national social security task force will look at this whole ecosystem and work with all the stakeholders to minimise duplication of efforts currently being undertaken by various agencies and also duplication of benefits. It will address basic poverty eradication and guarantee a comfortable lifestyle, especially for the aged,” said Balqais. Toh Puan Dr Safurah Jaafar, director of Family Health Development Division with the Ministry of Health, said currently more than 70% of the elderly are sourcing medical care from the government. “That limits their choices in terms of care and facilities. I think, if only they have the savings then their choice is bigger. How do you facilitate that?” she asked. According to AIA’s Anusha, more and more Malaysians are buying private health insurance, which has extended its coverage in recent years. “Originally, the insurance cover expired at the age of 60, then it became 70. Today, people are covered till the age of 100. So, basically people are covered for life. I think it comes back to awareness and making people understand that they can buy healthcare insurance,” she said. Explaining one of AIA’s products, Anusha said that the public can buy a policy where they pay very minimally for the premium while still employed because their employer has group insurance coverage for all employees, so they wouldn’t need much cover then. But, when they retire, the cover then drops down to the first level. “So, in post-retirement you continue to have this insurance coverage that you bought yourself which didn’t cost much initially and you continue to be covered until the day you die,” she added. Anusha believes it all boils down to raising awareness so that the public knows what products are available to help them save for retirement and which ones offer them the best coverage in old age. The public also needs to be educated on how to accumulate money while working and the decumulation after retirement. PPA’s Ong believes that it boils down to money management. “As to who is going to manage this money … it’s very personal. I think most of us would like to do it ourselves until we can’t. In the case of when you can’t, because you are disabled or have dementia or some other serious illness that prevents you from making a conscious decision, the good thing about our society is we still have our family members. “I think, that is our first line of defence because we have family members whom we can trust. Failing which, we would have to go to an outside party called a trustee. If you go to a trustee, then there are pros and cons. The advantage is that you can define what the trustee is going to do with your money, the disadvantage is the cost of doing that and losing flexibility because basically you are giving ownership of your finances and properties to an outside party,” he said. In developed countries, the decision of who should manage your money is taken out of the equation. According to Yip, in those countries, the government takes on the responsibility of managing the money for the people. “When you need it, they see how much you can afford to pay. Then, the government either subsidises or pays 100%,” said Yip. She questioned if it is possible to have a similar system in Malaysia, with a central administrator working with the financial institutions. Balqais explained that that type of system is quite different from the one we have adopted in Malaysia, and while it has obvious advantages, there is also a high price to be paid. “In Scandinavian countries, for instance, the rights of the people are protected at various levels in terms of healthcare, education and maternity. So, when a person retires, they have a sustainable income because the income will come for life. “But, in Malaysia, we are operating under a defined contribution system whereby there are no defined benefits. In most developed countries, there are defined benefits where you know you will be getting some sort of pension but that system has some concerns in terms of financial sustainability because of the demographic shift. “But at the same time we also see a trend of high tax rate. In UK for instance, it is 40% and in some Scandinavian countries it is 60%. Are Malaysians ready to pay that kind of high tax regime to finance a defined benefits contribution system?” she asked. Another option that the financial industry in Malaysia might look into is reverse mortgage since Malaysians still believe in buying property. Yip questioned if it is possible for those who have properties to use reverse mortgage to pay for their care in their advancing years. According to her, this is one of the products that Singapore is trying out. 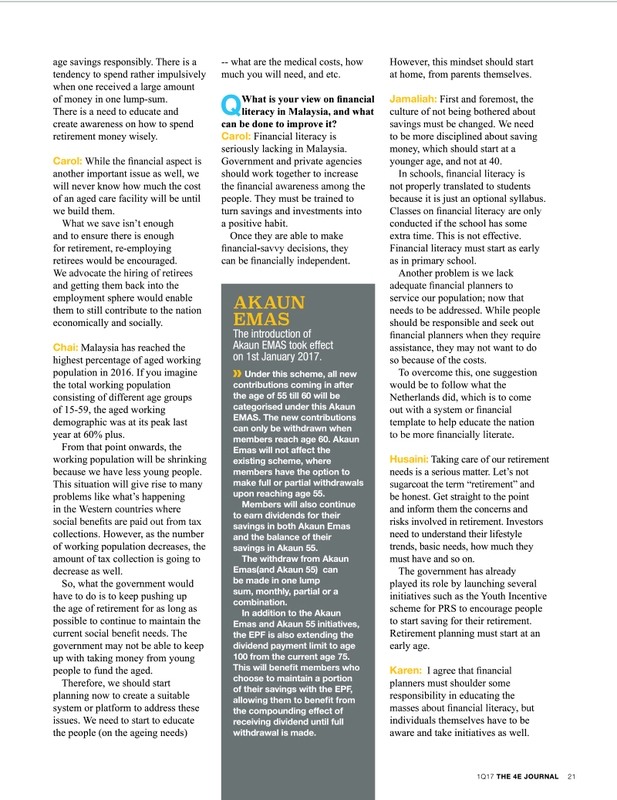 Anusha pointed out that reverse mortgage, which is currently not available in Malaysia, has its pros and cons. Sharing her experience in the UK about 20 years ago, Anusha said a lot of elderly were real estate rich but cash poor there. They would buy a product called equity release where the insurance company would pay them about 70% of the value of the property. Some of the aged who took equity release used the money to enjoy the remaining years of their life. However, there were also cases which did not have a happy ending as the elderly failed to inform or explain their decision to their family members. When they died, their family members became very upset that the insurance company suddenly owned their parents’ houses. Nonetheless, Anusha believes it is something that can be looked into here. “Perhaps back it with an annuity for life so you don’t give out a lump sum but have an income for life. “Then when they pass away, the remaining value of the property goes back to the family. But it’s important that family members understand what’s happening,” she said. While she believes reverse mortgage is a good product, Balqais reminded the floor that we have to look at it from a cultural context. “Are we ready to not have home ownership? Culturally, people want to own a house. At the same time, are financial institutions ready to offer this kind of long-term payment? In terms of take-up rate, we have to question and study that because the public may not be as prepared as the financial institutions,” she said. PPA’s Ong agreed with Balqais, saying that for most Malaysians, our home is our biggest asset. He also believes that reverse mortgage works only if you have a debt-free property. “The other thing about relying on your property to fund your retirement is that it’s not a surety because property values may fluctuate, depending on the location you are in and the property cycle. That’s something we have to keep in mind,” said Ong. Having listened to all the possible financial solutions, Dr Safurah said she feels hopeful about the future of the elderly in our country. However, obviously a lot more needs to be done and inclusivity should be a priority. “We say the product is not the main focus but I think at the end of the day, it still is because insurance companies do focus on very defined items that you can reimburse. We may lose a big portion of some groups of the aged who are not supported. Unless they are very ill, then only the insurance companies come in. “How about those who are no longer earning but need insurance support to keep them well and prevent them from falling sick? I hope that that kind of product is something that financial companies can look at,” she said. 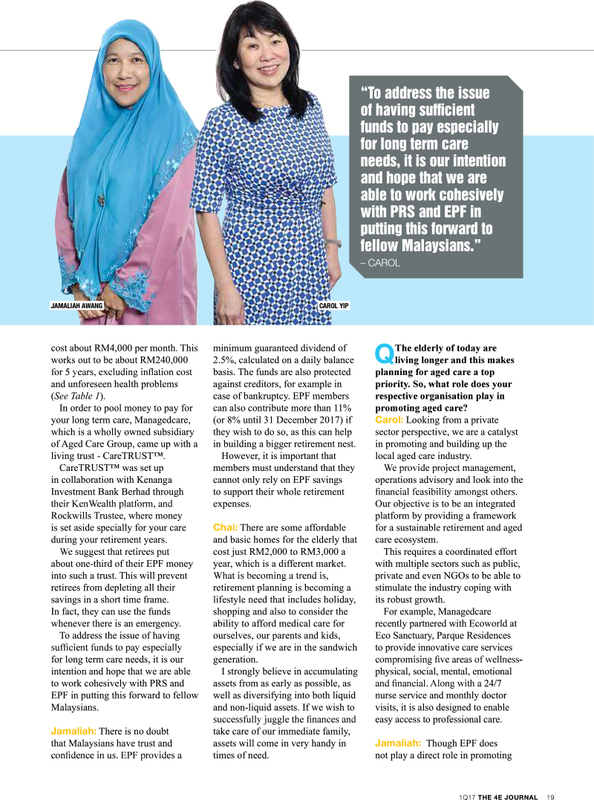 While Malaysia needs to find the right products and model to help its citizens save up for their retirement years, there’s no denying that awareness and education are equally important. According to Balqais, the root cause of people not having sufficient savings is financial literacy. 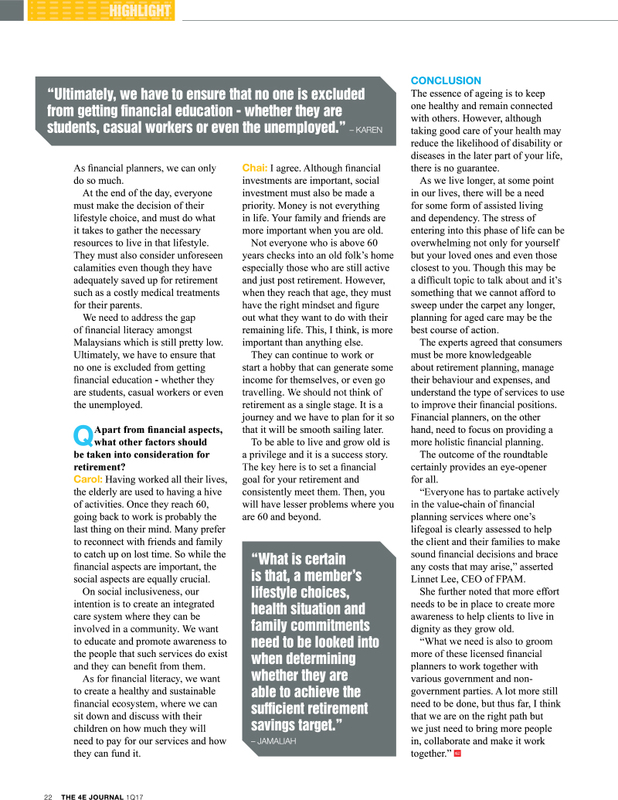 “The financial literacy rate in Malaysia is still very low. People do not understand about insurance – why do I need to pay when I’m not sure I’m going to get the money back? “So, when we speak at public briefings, members of the public say they don’t want insurance because they would have more money without it, but in the event of financial shock or distress because of medical illness, they do not have sufficient savings,” she said. She talked about EPF’s Retirement Advisory Services which offers free financial planning to the public. She hopes that this will help raise the financial literacy rate in the country. It is hoped that with financial planning, the public will be more aware of the need to save. Main photo: ACG CEO Carol Yip (left) moderated the panel discussion. She was joined by panellists Toh Puan Dr Safurah Jaafar and Dato’ Steve Ong. RETIREMENT is not just about how much you have when you stop working. It is about your next phase of life,” said Ismitz Matthew De Alwis, executive director and chief executive officer of Kenanga Investors. “What will you do for the next 20 years after retirement?” he asked the packed ballroom at the Sustainable Retirement & Aged Care Conference (SRACC). Organised by Kenanga in partnership with Aged Care Group (ACG), the conference, held at the Majestic Hotel in Kuala Lumpur last week, saw representatives from the government, private sector and non-governmental organisations (NGOs) coming together for a day of discussions, networking and seeking solutions. “Retirement is not something dull. It is not about the time when you stop working, go to day care and nursing home, while waiting to die. Retirement is the best phase of your life. It’s when you enjoy. Let’s get some colour into retirement,” he said. He explained that even in retirement there are different stages with the last stage being when you would need more care. There are many topics that can be discussed regarding retirement – from the financial side of things to where to live, what to do, and how to manage everything. “This is a big topic to cover. We have a lot of questions. We hope from today we can start sharing that retirement is beyond numbers. Retirement is an industry that we need to take seriously, along with the whole ecosystem that comes with it,” said De Alwis. The one-day conference featured three panel discussions. 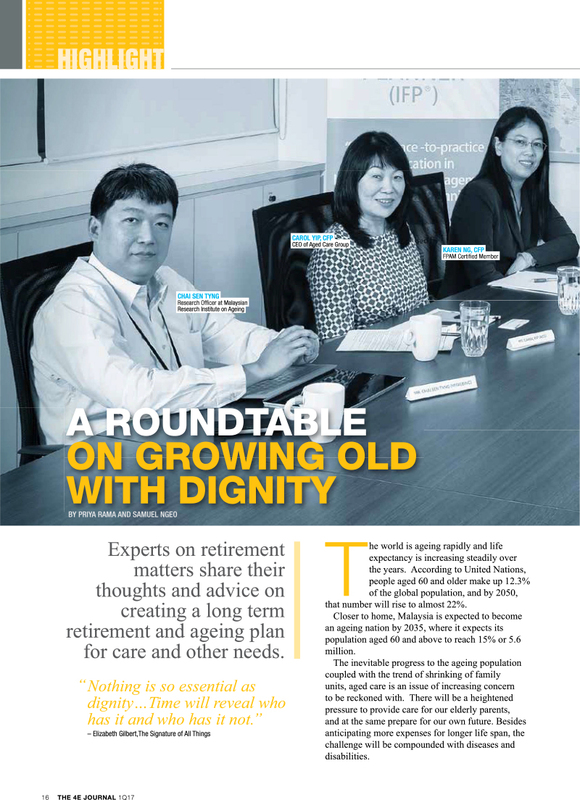 The first discussion saw representatives from the civil service, private sector and government agencies talking about Malaysia’s financial options for retirement and aged care to ensure lifelong sustainability. Can Malaysians afford to retire and how will they pay for their aged care? Will it come from the government, their pension, Employees Provident Fund (EPF), insurance, Private Retirement Scheme (PRS), savings, or all of these? Is it possible to have an integrated management system for all these, so that it is easier for Malaysians to pay for services? The panellists explored this subject and even took questions from the floor. The second panel consisted of foreign representatives who shared their experiences in retirement and aged care in Singapore and Australia. The third panel discussed private sectors and NGOs getting involved in the retirement and aged care ecosystem in Malaysia. While the conference did not conjure answers for all questions, it did start a lot of conversations and provided much food for thought. 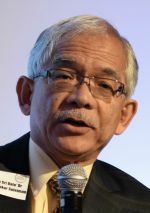 Panellist Tan Sri Datuk Dr Abu Bakar Suleiman, president of International Medical University, said, “In the 1960s and 1970s, no business wanted to build hospitals. So, who built hospitals? The doctors. Nobody else wanted to invest. They showed that it’s a viable business. After that, others came in. While there are parties who are keen to get into the industry, many seem to be adopting a wait-and-see attitude and trying to find the best business model first. “If we don’t build, we don’t have an industry and it becomes exclusive. When there are participants in the industry, then things will come to a palatable price. That’s what is important. “At this moment the industry is in its infancy. We need to develop the whole ecosystem,” explained Kenanga’s De Alwis. According to him, SRACC was held to get people from the private sector, public sector and NGOs to come together to look at the industry from a macro level and to look at building an integrated ecosystem, rather than working in silos. “That’s why this conference is called Sustainable Retirement & Aged Care Conference and not a retirement conference. We are talking about the third phase of life, the things that we need to do to make it a colourful retirement. “This is the next thing to come. It is going to be an industry. When the time comes, there are things that need to be catered for in this industry and we need the support of all stakeholders. “As you can see it’s a huge ecosystem that we need to work on. We talk about government policy makers, private healthcare institutions, the entrepreneurs, the financial institutions like Kenanga, and the educational and training institutions. I think this basically will make up a sustainable aged care infrastructure,” said De Alwis. In his keynote address, Fabian Bigar, Director (NKEA Healthcare) of Pemandu (Performance Management & Delivery Unit), spoke on “Delivering Transformation for Retirement and Senior Living in Malaysia”. 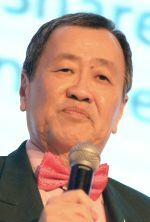 He provided the background of retirement and senior living in the Pemandu NKEA (National Key Economic Area) lab. According to him, it is estimated that the retirement industry would create about 10,000 new jobs and RM1.7 billion in terms of GNI (gross national income) in the year 2020, when Malaysia becomes an ageing society. “We received agreement in principle for all of this, of course subject to further discussions with the various agencies. Not everybody is moving at the same speed, so we have to leverage on those who can work faster,” said Bigar. According to him, the Private Aged Healthcare Facilities and Services Bill will be ready for tabling at Parliament by the end of the year. However, as there are many other items waiting to be tabled as well, the Bill might only see the light of day next year. While waiting for the Bill to be tabled, Pemandu has been working on the regulations. “We started this year, so that when the Bill comes on stream we can enforce it in a short time,” explained Bigar. In addition, the Department of Skill and Development has come up with the National Occupational Skills Standard (training syllabus) for the training of caregivers. The Malaysian Investment Development Authority (MIDA) has been looking at incentives for the industry to be gazetted as a promoted industry. 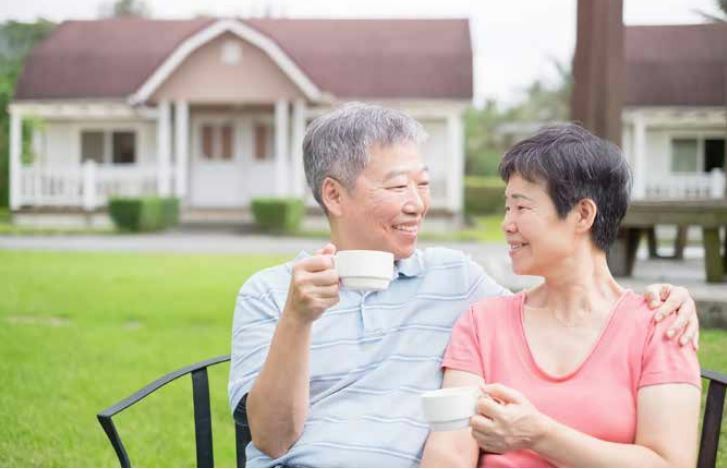 While the Department of Town and Country Planning has developed “Physical Planning Guidelines for the Elderly Facilities” which will serve as a guide for the planning and designing of a senior living facility. “These four agencies are already moving. As for the others, for example, finances and insurance, we will make sure that these things are put in place next year. “Obviously, there is a lot more to be done. I hope at this conference we will find some clues, if not answers, on how we can move this agenda forward,” he added. De Alwis said the takeaway from the conference is that if you are a business owner, an NGO or individuals needing helping or who have questions related to the elderly, you would now know who to contact. ACG is positioning itself as a platform for all parties to work together towards elevating the retirement industry. CareTRUST was derived to provide an avenue for those in the financial line to help clients manage the accumulation of their money and then the decumulation after retirement when they need to pay for services and facilities. This collaborative effort sees more than 12 unit trust companies, four insurance companies and seven PRS providers on the bandwagon so far. With ACG as the Care Administrator, CareTRUST would also see to it that the client’s wishes are fulfilled in terms of how they want to be cared for and where they want to live, when they are no longer able to execute these decisions for themselves. This is just one of the new products targeted at retirees. De Alwis added that the retirement industry will spur product innovation. “It is something that we will continue to search for at Kenanga, be it within our group or working with various partners. It doesn’t matter if the money goes here or there. At the end of the day, we are enlarging the pie. “We just need people who are brave enough to join in to build the industry. It’s not difficult and it’s not just to cater to one part of it. It’s a big part of the economy. It also can be very profitable if it’s done correctly. It’s an industry by itself. “We need to create a retirement industry, then everything will come into play. There are various programmes now like Malaysia My Second Home, but everything needs to link together. We have to look at the whole ecosystem of retirement. “On top of that, when we have more retirement products and services, of course, the cost will come down. It becomes a commodity. But, at this moment, no one dares dabble into it. If you look at it, five years down the road is a very short time, but in 10, 15 years, this will be a booming industry. “We are quite excited. It creates more dynamism in terms of how we treat this product-wise and services-wise,” said De Alwis. ACG chief executive officer Carol Yip pointed out that some parties in the country are already building facilities and offering services for retirees. However, demand is still more than supply. To speed things up in time for 2020, more players need to enter the market place. This would reduce the cost, and these facilities and services would then be more affordable to the masses. Speaking to reporters, De Alwis said that this year’s conference was more of an introduction to the infant industry, and next year should see a drill down to more intense topics. “We hope to see that there is growth and development, and we will be able to share more, get more speakers and expertise coming in to provide more advice. “Once retirement becomes an industry, Malaysians will take it more seriously and the whole ecosystem will fall into place. Our theme today is ‘A shared synergy towards an integrated ecosystem’. For an integrated ecosystem all the stakeholders have to come together in their own way. Like a jigsaw puzzle, all the pieces must fit together,” concluded De Alwis. Main photo: Ismitz Matthew De Alwis, executive director and chief executive officer of Kenanga Investors, presenting his keynote address at the Sustainable Retirement & Aged Care Conference.